Read from regular people about their commute experience or submit your story. Electric bikes are awesome. There are some decent-looking models out there, even some that don't look electric at all (Schwinn). The batteries are getting better too. Most models offer about 30 miles range or more, depending on the amount of hills you ride, how much you pedal along and what kind of batteries you have. Most electric bikes are "electric-assist" which means that you can pedal when you want to, it just makes it easier for you, especially up hills. There are also plenty of models out there that let you twist the grip and off you go, no pedaling required - however pedaling a little can greatly increase your range. It's up to you. Either way, if your battery ever dies.... you can still pedal home, can't do that when your car runs out of gas. These bikes are tons of fun, they can go pretty fast too, 20 MPH or more, depending on which one you get. Local laws may regulate how fast they are allowed to go and where. I think if we were all a little smarter we'd be riding electric bikes to work and saving TONS of gas/money. What's so great about electric bikes? I've found tons of good info and bikes on these sites. 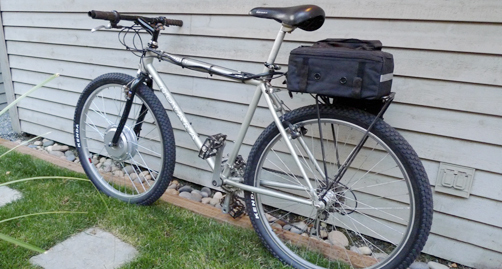 This is my electric bike, made from a $300 Wilderness Energy kit. That's the motor in the front hub, battery pack on the rear rack. Installed on and old mountain bike in a few hours. You can buy an electric bike ready-to-ride or you can get a kit and convert an old bike yourself. There are a lot of kits out there in the $250 - $500 range. Most of them seem reasonably easy to install for your average do-it-yourselfer, with anywhere from 1-3 hours of tinkering. My Wilderness Energy kit (shown above) was pretty easy to install, but not quite as easy as W.E. advertised. For one thing, the motor was too wide to fit in the shock-absorbing fork that came on the bike, so I had to swap the fork out. I found a $5 used rigid fork and a used headset at my favorite local shop Recycled Cycles (Seattle). Changing a fork is not too complicated, but it definitely falls under "bike repair" and is more than you might have expected based on how easy they say the kit installs. You may or may not have to do this yourself. Also, the slots in the dropouts (flat tabs at the ends of the fork, where the axle goes through) were not quite big enough for the big, fat motor axel, so I had to file them out just a little bit. Finally, I had to locate some washers at the hardware store so that the axel nuts would mate up snugly against that fork, which has little structural gussets at the sides. These modifications are easy if you are handy with basic tools, but they could make the installation stretch out over a few days if you don't have much free time, like me, and you have to run to the store a couple times. No big deal. I'd suggest looking on eBay and Craigslist as well. Motors - Electric bike kits come in many types. Some have a Hub Motor, which is a motor laced into the front or rear wheel. These look pretty slick (See Winderness Energy). If you don't get a hub motor kit, then the motor will be mounted externally (See Clever Chimp), and linked to the drivetrain with a chain or belt. There are also Brushed and Brushless motors. Brushes are an internal part of a motor. Brushes can wear out like bearings. Brushless motors are a newer technology, they are quieter, more powerful and require less maintenance - but they are more expensive. For the average bike commuter, either kind will be just fine. Brushes take a very long time to wear out. You'll probably never have this problem, and they are cheap to replace anyway. VOlts - Some kits come in different Voltage options. Most typical are 24, 36, and 42 Volts. More Volts means more power, but also requires more batteries, and so costs and weighs more. For flat terrain, 24 volts is probably fine. A hilly ride might be better at 36 or 42 Volts or if you just want a little more speed. I read a lot of reviews, 36 Volts seems perfect for most typical commuting situations. 42 was borderline excessive in most cases. Sealed Lead Acid (SLA) - Heavy, cheap, powerful, reliable, best on a budget. These are the same as car and motorcycle batteries. Lithium Ion (Li-ion) - Lithium Ion batteries have the best power-to-weight ratio available at this time. They are powerful and take up little space on your bike but they are expensive. Get 'em if you can afford them. Nickle Metal Hydride (NiMH) - Nickle Metal Hydride batteries have mostly replaced Nickle Cadmium (NiCd) as the standard off-the-shelf rechargable battery. They are cost effective, and sufficiently powerful for most typical applications. They are not as light, small, or powerful as Lithium Ion, but they are much cheaper. Nickle Cadmium (NiCad) - These are being phased out. Skip 'em. Battery Chargers - Some batteries can be damaged if they are over-charged. A "smart charger" detects when your battery is full and shuts itself off. Worth looking into. Build an electric bike - more technical information on building your own electric bike from parts (not a kit), saving even more money, but mostly having some fun custom-building your own ride. There are lots of cool parts available on ElectricScooterParts.com as well as eBay. Electric bikes have come a long way! Get to work without sweat! 30-miles plus range, etc.